If I were to blindfold you and make you listen to Enhuma's debut album La tête dans la chèvre, you would bet your life that this is a lost Mr Bungle album, but then at the second song you would already wonder where Mike Patton learnt to sing so well in French. 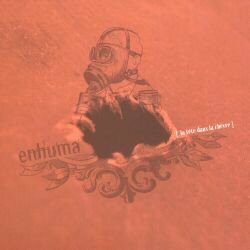 Enhuma are a relatively young band from Brest, the westernmost city in France, right on the Atlantic Ocean, and after a free downloadable demo-EP, they finally enter the scene with a self-produced digipak album that shows them from a severely matured side. On the opener The Last Cartoon, they combine theatrical rock antics with progressive metal lines and jazzy trumpet moments. Enhuma call their style fraggle rock, and unless they ever become big (not so likely with kind of weird music), Jim Henson or his trust will certainly not sue them for using his muppets to describe their sound. Stridulation gourmande à coeur ouvert delivers more of the same, just this time in French, before two more experimental tracks, Paul and Allen, follow. Those two seem to be repeated in reverse on the album closer Luap nella. Even I got that simple anagram. Figurine Burlesque is a short, quirky track with a Primus-like atmosphere. Trickery is more accessible though still miles away from commercial radio fodder. The experimental freejazzy ## gives you a break from the more song oriented material. Porky Pink Lady is the longest song on the album (8 minutes), and proves that Enhuma are just as much at home when they use more epic structures. And just to show that they can, that track is followed by the not even half minute long grindcore attack GI-17. Vésanie is again more of an epic track, just like White Cowboy Without Shoes. In between there is one more experimental piece (#) and Landscape. Enhuma's list of influences is impressive: Mr Bungle, Frank Zappa, Sleepytime Gorilla Museum, Honey For Petzi, Primus, Tool,... You can check on it at their Myspace site. But in the end it all sounds always very close to Mr Bungle, an in my opinion severely underrated band that released anyway only three albums in their time. So why not let Enhuma carry the beacon of avant-garde funk prog sound? La tête dans la chèvre is an impeccable album that deserves to be listened to by everyone who is tired of bands who try to sound all the same! And with a little bit more daring and originality, next time they get certainly more than the now already 8 big points.